About | Food Should Taste Good | Super Long Name. Super Delicious Chips. ingredients. That’s why I started my own company, dedicated to making wholesome snacks. As for the name, Food Should Taste Good™, it kind of wrote itself. 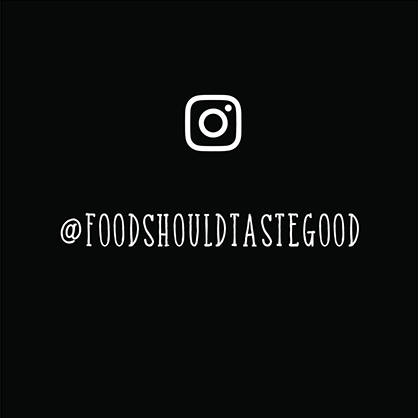 Founder Pete Lescoe created Food Should Taste Good, Inc in 2006 with the goal of making a unique new snack with great taste, real ingredients, and sophisticated flavor - the qualities he is most passionate about in food. With a name that speaks for itself, Food Should Taste Good™ chips are made from high quality ingredients. All chip varieties are gluten free, cholesterol free, have zero grams trans fats. They are also certified Kosher. Plus, many varieties are certified vegan. Food Should Taste Good™ chips are available nationally at conventional grocers and natural food markets. For more information, please contact us. Consumers want to know what is in their food. And we at Food Should Taste Good want you to know what's in ours. We understand that knowing whether food is produced with GMOs is important to you. In the spirit of transparency, we've enrolled our products, which have always been made without GMO ingredients, in the Non-GMO Project. As our products become verified, this third party certification will provide you with additional assurance that our products are produced without the use of GMO ingredients – and we are thrilled to announce that Multigrain, Sweet Potato, Blue Corn, Guacamole, Olive, and Original Kettle Cooked Sweet Potato are the first of our products to be verified by the Non-GMO Project. While our products undergo the verification process, we have chosen to update our packaging to reflect our ongoing commitment to using ingredients made without the use of genetic engineering (GMOs). Be on the lookout for our bags which proudly call out that our chips are "Not Made With Genetically Engineered Ingredients." Choose Certified Organic Products: Organic foods are prohibited from being made with biotechnology (GMOs). The USDA Organic seal is verification that the ingredients used are non-GMO, even if the package does not separately call out the ingredients as non-GMO. Products labeled as “Made with organic ingredients” also cannot be made with GMOs. You can verify organic certification by checking the fact panel for a ‘certified by’ statement. One quick rule-of-thumb: a product can be non-GMO without being organic, but a product can’t be organic without being non-GMO. Choose products with non-GMO Labeling: If a product is labeled as non-GMO, or not made with genetically engineered ingredients, it likely is non-GMO. Third party verification organizations, like the Non-GMO Project, for example, audit and verify that a product is non-GMO for further assurance. For more information about the non-GMO verification process, visit the Non-GMO Project website. Only a limited number of crops in the United States have GMO equivalents. You can find a list of common ingredients from these crops on the Non-GMO Project website. Food Should Taste Good is committed to providing you and your family with foods made without GMO ingredients. We feel we are making a positive impact by increasing non-GMO acreage as we grow. Food Should Taste Good continues to uphold the same beliefs we’ve had since our founding, including the value we place on using non-GMO ingredients. We hope you will recognize the great care we have taken to maintain this integrity over time. We appreciate your support of our products, and we pledge to continue to always do right by you with our actions. Learn more about our products & certifications.